The age-old dilemma of what to do with a second hand car once it has past the point of an easy sale is an irksome one. Things were a lot easier when the government offered a wad of cash to rust bucket owners in return of a scrappage promise but now, old car owners are often left to pick up the bill from the breakers. 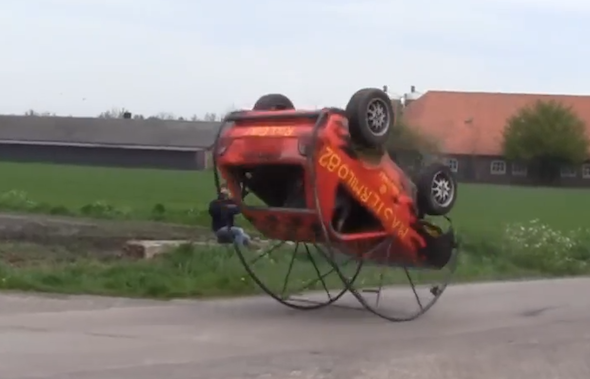 But a select group of engineering enthusiast from Holland decided not to send and old Volkswagen Golf to the grave yard and instead opt to fit the banger with an enormous exterior roll cage that enables it to somersault through the air. The crazy contraption is the brainchild of Master Milo and his SAS Team – a group of mates that like to fabricate bizarre vehicles from old bits of scrap. The Mark 2 Golf 1600 automatic was bought for 25 Euros from a local garage and the boys decided to cut the car in half to shorten the wheelbase to enable it to pitch forward more violently under heavy braking. An exterior roll cage was then added plus a 'liquified petrol gas fuel system' to stop is stalling mid roll. Raised suspension from a VW Golf Country was also bolted on and the RollGolf was ready for a test run.